I am always greatly inspired by yogini Dona Holleman, who has been teaching yoga over 50 years. Dona studied with B.K.S. Iyengar in the 60’s and was part of a group of professional musicians and spiritual teachers who spent time together in Italy. This group included Yehudi Menuhin, Vanda Scaravelli (seen above), and Jiddu Krishnamurti among others. It is interesting to see how her journey has evolved through the years. On her website she expresses how her “two main interests in life, yoga and horses, have finally come together harmoniously”. I feel the same way about my two passions in life- yoga and music. Studying the sublime and deeply spiritual music of the great masters has widened my horizon even more than I imagined. Music has been an avenue of practice, and has taught me, and continues teaching me, many things about myself, and life in general. For me yoga and music are not such different disciplines but two spiritual art forms that inform and support each other. A great example of this is the relationship between B.K.S. 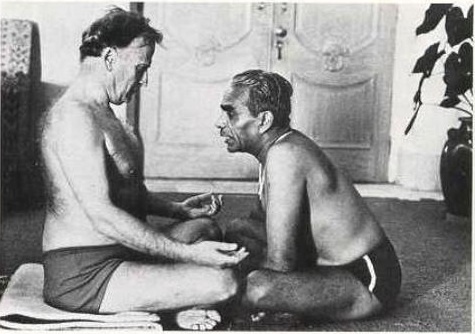 Iyengar and Yehudi Menuhin. Menuhin met B.K.S. Iyengar in India in the early 50’s while Menuhin was on a concert tour. He had been invited by Jawaharlal Nehru to give a series of charity concerts for the Famine Relief Fund. 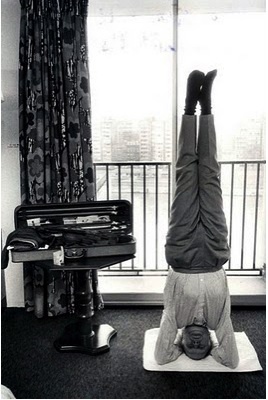 While he was there he expressed his interest in yoga and during a meeting with Nehru and performed a headstand for him, which made the headlines all over India. Menuhin wanted to learn more about yoga and B.K.S. Iyengar was one of the yogis invited to come and meet him. Iyengar was reluctant to go, due to the amount of travel time involved, but then agreed. He spent a couple hours with him, correcting his Sirsasana, and then brought him into a long 50 minute Savasana. This was a wonderful gift as Menuhin had been suffering from insomnia. When Menuhin woke up from this deep state of “Shanmukhimudra” which Iyengar induced by manipulating his eyes, ears and nerves, he immediately requested to study more with him. In 1954 Iyengar spent more than six weeks in Gstaad, Switzerland, as Menuhins’ personal yoga instructor. He travelled with him to Britain and France and then continued to teach him in Europe most summers until 1984. Through Menuhin, Iyengar was introduced to, and taught many famous musicians including Pablo Cassals, Rudolph Serkin, Jacquline du Pre, and Vanda Scaravelli. Menuhin had already been suffering from a variety of muscular and skeletal aches and pains. Under the programme of asanas that Iyengar prescribed for him, Yehudi Menuhin’s muscular pains disappeared completely. Menuhin wrote that “yoga made its contribution to my quest to understand consciously the mechanics of violin playing”. He and Iyengar developed a life long friendship and he called Iyengar “my best violin teacher”. Through his yoga practice, Menuhin was able to sustain a long, illustrious career. His recording contract with EMI lasted almost 70 years and is the logest in the history of the music industry. He made his first recording at age 13 in November 1929, and his last when he was nearly 83 years old. In 1982, he was invited to conduct the celebrated Berlin Philharmonic Orchestra at it’s 100th jubilee celebrations, and he conducted the opening of Beethoven’s Fifth Symphony standing on his head while directing the orchestra with his feet! Although I am a very amateur musician, my experience with yoga and playing the piano is equally profound. Yoga has made it possible to find physical fluidity, postural balance, focus, and the body awareness which are necessary on the journey towards allowing the music to express itself unhindered. The practice of listening, of deepening the mind-body connection, of releasing obstructing tensions involves everything psychological, physical and spiritual, which is what yoga is all about!